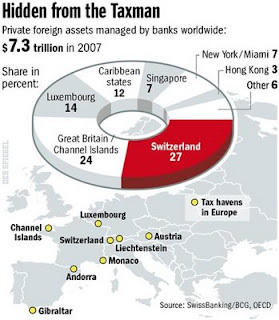 "Tax havens" - one of the Great Sideshows of the G20 one angle of which is covered in this piece from Der Spiegel (includes the graphic at right). "In practice OECD countries have much laxer regulation on shell corporations than classic tax havens...And the US is the worst on this score, worse than Liechtenstein and worse than Somalia." Which was one conclusion from a study reported upon with some glee by the Swiss paper Le Temps under the classification "Economic criminality". The G20 communiqué when issued will be required reading for long term policy makers in some of the smaller, honourable jurisdictions. Hypocrisy or not, will it be possible given the G20 inquisition to differentiate from the rest and maintain a significant offshore industry? With Liechtenstein (in the form of their largest bank LGT Group) appearing to give up the ghost the others may need to produce some imaginative thinking to prosper.